Spring is here. School is almost out. 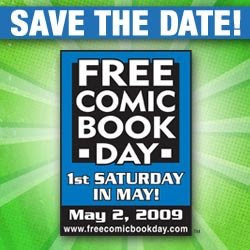 Both signal the great annual comic give-a-way known as Free Comic Book Day (FCBD). It is a beautiful Saturday – the first in May – and regardless of weather you can celebrate that weekend with loads of free comic literature. It's easy and there is no catch. Designed to rebuild interest in comics, FCBD does exactly what it states. Go to your local comic book store. Choose a free comic from the stack of available FCBD comics available. Some stores allow one comic per customer. Others allow you to take 2-4. I've found some that let you take one copy of everything offered. Teachers: This is an excellent way to build your comic library or to stock up on prizes. Promote the day with your students and give it a try yourself. I always go and bring home a haul to give out to young readers.